To get the film in theaters, Aglialoro and Kaslow created the Atlas Distribution Company and set April 15, 2011 as an opportune date to release the movie. This gave Atlas Distribution almost no time to market and promote the movie, so they turned to the expertise of Scott DeSapio, a successful online marketer inspired by Atlas Shrugged. DeSapio quickly began designing a website that became the primary marketing engine as well as the foundation of a "Galt's Gulch" community to spread awareness of the movie. As the "demands" of Atlas fans to see the movie in their area grew, so did interest from theater owners, which changed the distribution plan. Instead of a 100 theaters "platform" release, the number of theaters grew to where the movie ultimately played in 700 different theaters. Nearly $4.7M of box office was generated, which the industry considered outstanding for an independently released movie supported primarily by online marketing. Even though the box office for Part I resulted in a successful opening weekend, it never generated the word of mouth every movie hopes for and Part I ultimately lost momentum in the weeks that followed. Nonetheless, Atlas Shrugged Part I was recognized with a number of awards including an award from the Santa Catalina Film Festival (winner - Ronald Reagan Great Communicator Award), Saturn Award (winner - Best DVD Release), and Graphic Design Junction (winner - Best 2011 Movie Poster - For Design Inspiration). Obviously disappointed by the theatrical revenues, Aglialoro thought long and hard about whether or he would continue the trilogy and fund Part II. Fortunately, there were others who believed in the importance of bringing the message of Atlas Shrugged to the world. 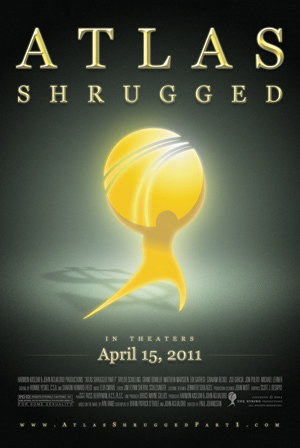 William A. Dunn, a successful fund manager, along with Aglialoro and six others made substantial financial commitments in the hope that Atlas Shrugged Part II could be in theaters before the national election November 6th 2012. The investors viewed Atlas Shrugged as a warning about what happens when government takes power and limits economic liberty. They believed it was a warning that needed to be heard before American citizens went to the ballot box.